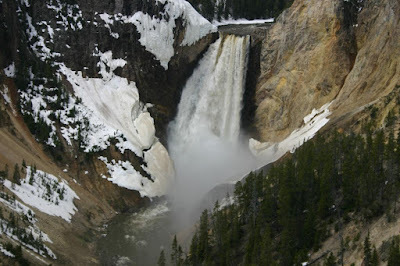 As I have said in the previous posting, Yellowstone is BIG, REALLY BIG! 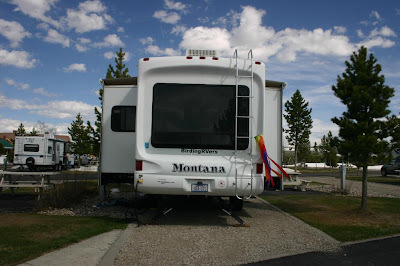 We have now driven over 500 miles inside the park and walked all of the geyser basins, today we’re taking a rest day. As a lifelong Californian I have no experience with snow. I always thought that it melted inches per day. The past 4 days we have had outstanding weather with highs in mid 70’s. The snow has been melting feet per day. (Although as I write this it has been snowing for 2 hours and it is only 35 degrees at mid-day). 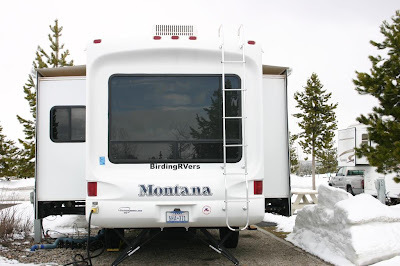 As you can see in the before and after pictures the RV Park has really cleared of snow in just a few days. Inside the Park, the rivers are rising and the meadows have become lakes. This has pushed the buffalo and the elk even closer to or onto the roads. For some reason Raider doesn’t seem to mind the elk, but barks at the bison that walk past the truck. There is so much snow in the Park it will still take weeks for the snow to melt. around the geyser basins all of the trails seem to be closed either from too much snow, under water or “Bear activity”. We still have managed to cover enough miles to be sore. Wolves, Elk, Bison, and Grizzly Bears are all well and good, but the REAL reason people come to Yellowstone is to see the “Thermal Features”. 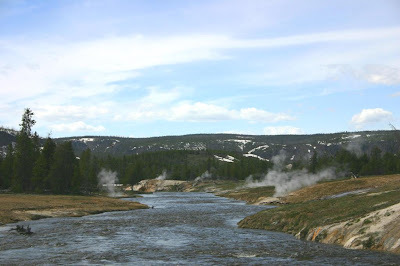 That is park talk for geysers, hot springs and mud pots. 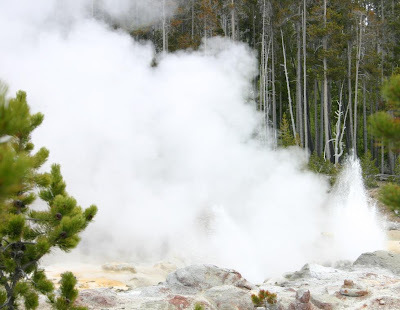 Everyone first goes to see Old Faithful, but the geyser basin it is in has many other geysers. You are walking along and they suddenly go off without warning. 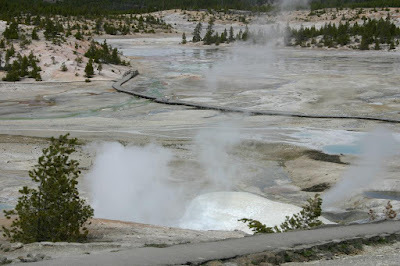 There are many geysers, hot springs and mud pots along the road for miles around Old Faithful. About 30 miles North of Old Faithful is the Norris Geyser Basin. In the Old Faithful area is, there are asphalt and boardwalk trails, while the Norris Basin is either boardwalk for safety or dirt trails. It has a different feel than the Old Faithful area and is quite extensive. Again, there are other geysers, hot springs and mud pots in the area. 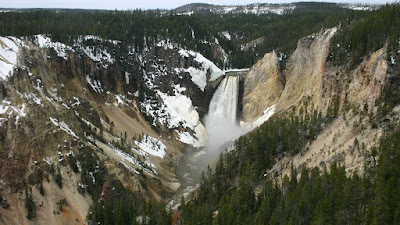 Yellowstone Falls No trip to Yellowstone would be complete without a trip to see Yellowstone Falls. 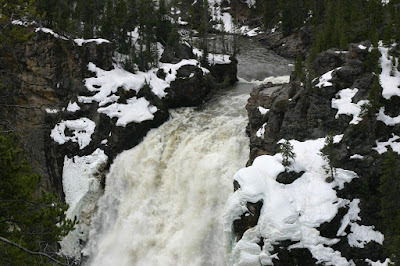 There is much more snow in that part of the park so, many of the overlooks are closed, but with the rivers rising the falls are spectacular. Sunday we did a “Big Sit”. We took a picnic lunch and sat along the Madison River and let the birds come to us; a very restful afternoon. The only new bird we saw for the year list was a Clark’s Nutcracker. Every day we see Bald Eagles, Ospreys and Mountain Bluebirds. One little bird we could hear for days was bugging us, because we couldn’t find him! Finally, Kathy starting imitating his call and he came in closer! It was a Ruby Crowned Kinglet! We don’t have them back in San Jose, CA during the breeding season, so we didn’t recognize his call or song! Mystery solved!